The Qlipr system fits right into the UrbanFarmers philosophy, which is based on creating added value and minimizing waste. At the UF002 farm in The Hague, consisting of a greenhouse with a surface area of 1,000 m2 on top of a former office building and a Tilapia fish farm, that philosophy has been taken into practice. The waste water of the fish tanks is turned into nutrients for the plants in the greenhouse. In the greenhouse, different varieties of lettuce, tomatoes, cucumbers, sweet peppers and aubergines grow in a hydroponic system. The water that is not used by the plants is purified and pumped back to the fish farm, which reduces overall water usage by 80%. Pesticides are forbidden; only biological plant protection methods are allowed. The products are sold to customers in the region, to minimise food miles. ‘We grow fresher, tastier and healthier products, as close to our customers as possible. And we minimise waste,’ Paul Jeannet explains. Six months ago Paul got in touch with Cor Pellikaan and became interested in the Qlipr system. ‘We wanted to give it a try to see if it would work in different crops. Three months ago we started using the system in tomatoes, cucumbers, sweet peppers and aubergines. As it turned out, the system is quite easy to use: we take the lower clip and place it on top and we lower the plant at the same time. It is quite different from the normal plastic clip we were using, but once you get used to it is very easy to use.’ The lowering schedule is once a week for tomatoes, three times every two weeks for cucumbers and once every two weeks for sweet peppers and aubergines. Cor Pellikaan, the inventor of the Qlipr system, needed a pilot project to test his clips on sweet peppers and aubergines. Until three months ago, the system - which he invented in 1996 - was only used by growers of tomatoes and cucumbers worldwide. The system consists of a crop hook (1.40 meters long) and two clips. Halfway through the plants’ development, extra crop wires are needed with which to fix the crop hooks into place. The main advantages of the system are, according to Pellikaan: ‘It’s very simple to use. Everybody can work with it. It will save labour, because you can de-leaf, remove shoots, prune and lower the plants in one go. This is also better for plant health, because there is less chance of damage.’ Paul Jeannet confirms that he saves up to six hours a week in the rooftop greenhouse because he uses the Qlipr system instead of regular plastic clips. How many clips are needed to bear the weight of the plants? ‘At the start of the season one clip will suffice. You attach it at 40 cm below the head of the plant. When the plants get heavier you will need to add a second clip, Cor Pellikaan explains. A new item in the Qlipr product range is the double-stop crop hook of 1.40 meters with two stoppers: one at 50 cm and one at the bottom of the hook. This makes it possible to use the same hook for tomatoes as well as cucumbers. Pellikaan thinks the Qlipr system will also benefit growers in the future. 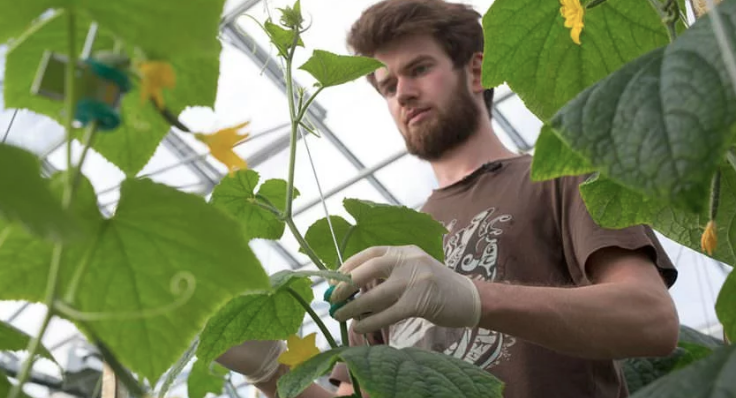 He is working on a mechanical system to pollinate crops without the use of bumblebees. It has been tested thoroughly and he expects to launch it this year. He is also working on a robot that can harvest and de-leaf tomatoes, which is still a prototype. That is still a bit of a secret, so we will stop asking here. It is clear that Cor Pellikaan is still coming up with new inventions for international horticulture to create simple solutions that work. This article was created in collaboration with UrbanFarmers and Qlipr. Text and pictures: Mario Bentvelsen. Video: BrokxMedia.